The PetQuip Awards 2019 will take place in association with PATS Telford on Sunday 22nd September. 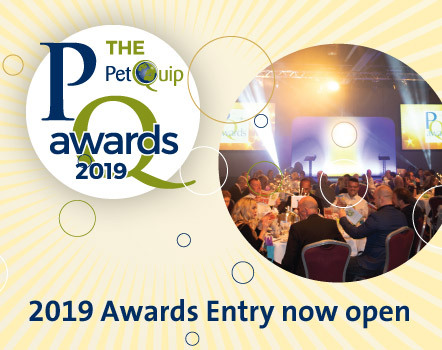 Entry for the awards is now open and they are free for all to enter, simply add your details to this form below, return it to info@petquip.com and we will acknowledge by giving you some guidelines for the categories entered. We are also happy to receive nominations for retailers or suppliers who in your opinion deserve to be winners. The nomination can be made anonymously, and we will always contact anyone who has been nominated to progress the entry. Complete entries need to be sent to pat@petquip.com by June 28th. Postal entries can also be made to the head office address on the form. Entries will be put through an initial screening test, finalists will then be named before the independent judging panel sits down to choose the winners at the end of August. Supplier entries are judged by a panel of retailers; retail entries by a team of independent specialists with retailing and marketing experience.